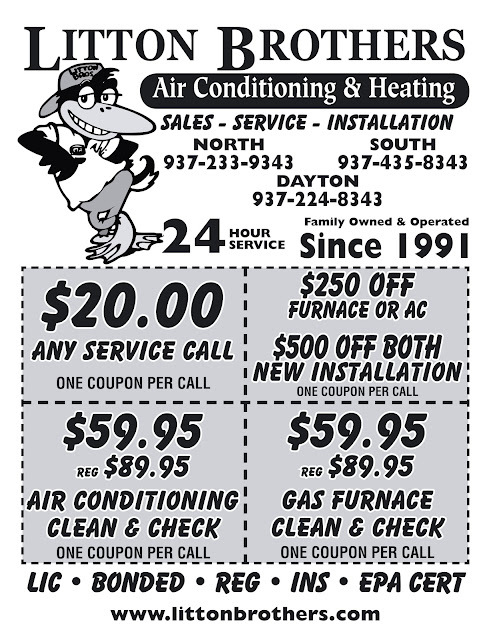 LITTON BROTHERS AIR CONDITIONING & HEATING DAYTON, CENTERVILLE, HUBER HEIGHTS, KETTERING: WHERE DOES DAYTON TURN FOR WARMTH AND COMFORT? LITTON BROTHERS! WHERE DOES DAYTON TURN FOR WARMTH AND COMFORT? LITTON BROTHERS! The fall season is upon us and the cooler temperatures outside have us pondering whether to flip our thermostats to heat mode. 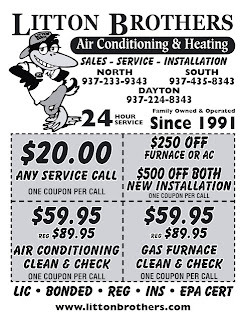 Before you do so, it is imperative to have your heating unit professionally cleaned and checked, and no company in the Dayton area will provide its customers with a more thorough, quality service (or a better price) than Litton Brothers Air Conditioning & Heating. Litton Brothers — and its 23 years of A-plus service (according to the Better Business Bureau) — is offering their quality clean and check services for just $59.95 — $30 off the regular price. It's time to call the best ... and that's Litton Brothers!